Described as a book on Marie Antoinette, that is not quite right. The book is so much more. 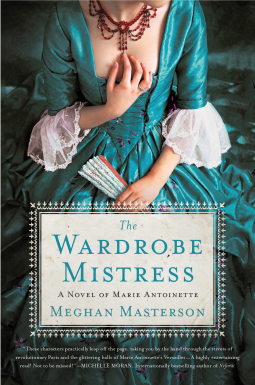 It details the life and times of a woman who worked for the Queen before the Revolution, her life during and finishes with the death of Marie Antoinette. As such, it is descriptive of the time of the Revolution and the life and time of Parisians particularly at the time. It was a turbulent time and Marie Antoinette did not help herself at all by her behaviour. Her reserve was put down to arrogance, she was detested because she was foreign (Austrian) and whatever the King did or did not do, was put down to her influence (it was not). The King was indecisive and twisted every which way. Even after a decision was made, he could easily be swayed by any one of his Ministers who did not help his situation either. Giselle is one young woman who works for the Queen particularly looking after her wardrobe. This is an area which has special interest to Giselle who hopes one day to design and make dresses for a living in her own shop. She is also a spy. This she does in a very unobtrusive manner in which no one, neither the Queen or her trusted woman Madam Campan is aware at any time of the double life which Giselle leads. Though she has been instructed to keep her ears and eyes open for any untoward happenings in the Royal Household, Giselle is sympathetic to the Queen and her plight because she realises very early on that the Queen is being held accountable for any wrong that goes on in the country. Unfortunately for Marie Antoinette, rising prices and the power of the nobility is so great , that nothing is done for the masses and the time for rebellion is ripe. Nothing is going to stop it now. The end of the dynasty in France was pathetic, demeaning and aggressive. It did not bode well for France but people who were starving just wanted a change. They saw the opulence of the court and saw the poverty of their own lives in stark contrast. Giselle herself was not aristocratic but from a middle class background and she saw and understood life on both sides of the divide. She understood the hardships of the ordinary people very well but she also knew that the King and Queen were being guided by the wrong people and nothing could be done to save them. Giselle herself was a self contained soul, she wanted what most young people want. A decent future, a husband and a happy home. She got out when she could because as she and her young husband knew a witch hunt would start to weed out any Royal sympathisers and having worked for the Queen loyally throughout, Giselle would be suspect. The story of Marie Antoinette though in essence the story, the life of Giselle is for me the more focused part. The Revolution itself is the background. The story was descriptive, and detailed. The book was sent to me by Netgalley, for an unbiased review courtesy of St. Martin's Press. I think my mom would love this. I enjoyed this novel. Nice review, Mystica. this sounds really good. I think that both my mom and myself would enjoy it. This sounds wonderful. Thanks for sharing it! I saw Mary's review for this and she liked it too. I like it when an author takes an imaginary person in a historical setting. I'm glad you enjoyed this story. I'm sometimes puzzled, though, by the way we seem to romanticize court life. It seems like it was a very dangerous place to be! Happily married with three children. Interests are children who need help, quilting and reading.